The package arrived today and we are so overwhelmed with not only the quantity but the quality of the fine bedding your group sewed for our rescue. We cannot thank you enough for all you do for shelters all over the country. Many blessings to you and all your sewing group. Hello Florence! I just wanted to let you know that we got the bedding here at Kings ferret rescue! 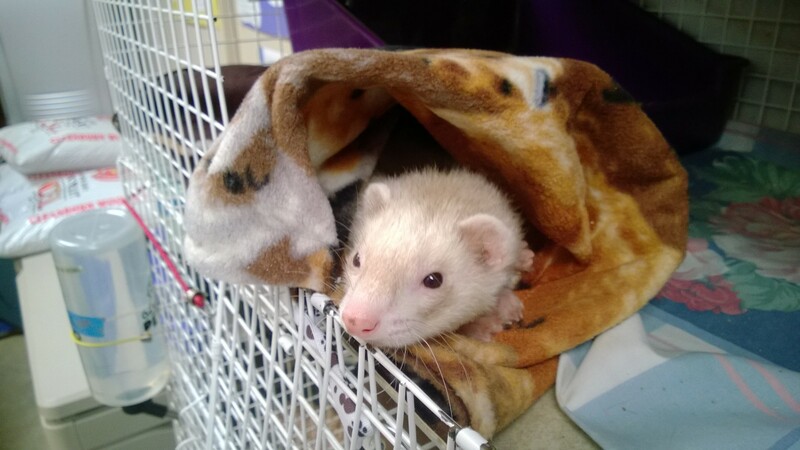 I’m sorry I did not let you know sooner, things have been extremely hectic, either way I want to thank you so very much from the bottom of not only my heart, but from all of the ferrets as well! You guys went absolutely above and beyond. what you guys do is absolutely wonderful. I know I not only speak for myself, but all the shelters that you guys help when I say keep doing what you’re doing, you guys are truly angels on Earth. 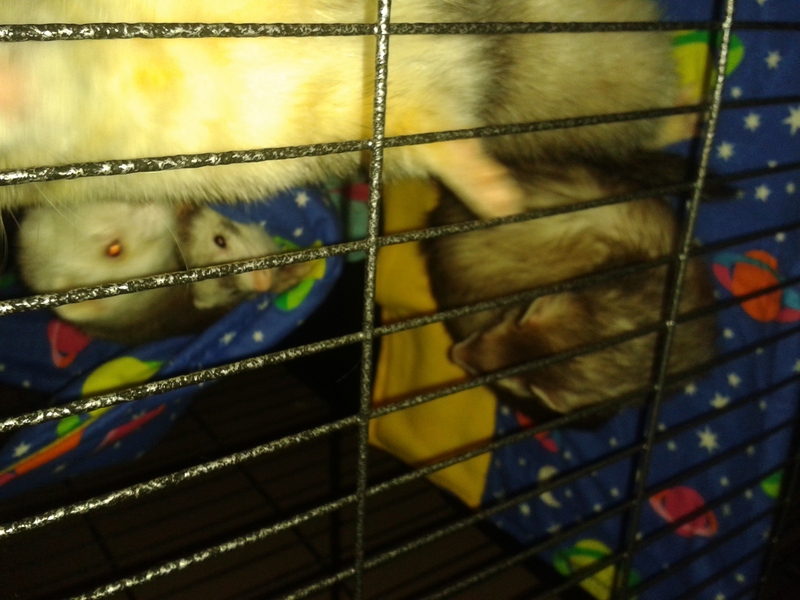 I’ve attached a few pictures of some of the bedding set up as well as some of the ferrets enjoying the bedding! thank you again so very much. Please let me know if there is anything that we can do to thank you guys for wonderful this wonderful thing you amazing ladies have done. I hope you don’t mind, but I also attached a picture of one of the reasons we’ve been quite busy… Our foster dog had puppies! Anyway, please let me know if there’s absolutely anything we can do for you guys. We hope you all have a wonderful week, and thank you again. Thought you would like to see that the barrel is a big hit!!! There were more inside toward the bottom of the barrel. We received your wonderful box of goodies today for the shelter babies. We are so incredibly grateful for your generous donation and all the hard work that goes into putting these amazing bedding pieces together. You all are true angels! Holey Cow!!!!! You and the CW gang not only made me a ton of beautiful and very functional bedding, but I could feel the love in each piece!!! I’m blessed for you all to have done this for my shelter. I’ll be replacing the bedding this week and will send a few pics! One of the things I love about ferrets is that they show gratitude. As much as I enjoy the new bedding, they do too! I can already expect them to leap and play in the new fresh bedding! From the bottom of my heart, I’m grateful and please extend to the crew my appreciation! 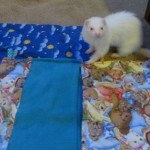 Please extend my thanks to everyone for the generous beautifully made bedding, carrier, and toys for the ferrets! Much more than anticipated! The carrier hammocks are cleverly made with the button attachment and the sick fuzzy carrier will certainly be put to good use for the seniors! Salem was quick to tote off one of the toys to his hidey hole as soon as he noticed it! Thank you so much from me and fuzzies! 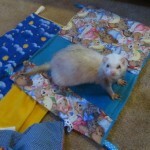 Thank you for sending GCFA the wonderful bedding from Crafty Weasels! We have 100+ fuzzbutts now and each time a few go home, we receive more in a few days. Thank you for helping us with this lovely bedding. The Crafty Weasels provide an important service to shelters. I am absolutely without words to thank you and the Crafty Weasels for your very generous donation to us. I wish I could tell you how happy the kids will be with all this amazing stuff. I don’t know how we were fortunate enough to be included in your gifting, but rest assured the things you sent are so very greatly appreciated! You guys do so much for the ferret community, and it’s a shame there isn’t more recognition & thanks for all of the comfort you have given to ferrets everywhere. You and your crew are just the greatest!!! With much love & appreciation from Zoo and all of the ferrets at Zoo`s Ferret Sanctuary, N.F.P. We all were very touched by the quality and amount of bedding. The cozy carrier is so precious and will be very useful for older ferrets. We also love the fact that the hammocks also double as cuddle bags. Amazing work! 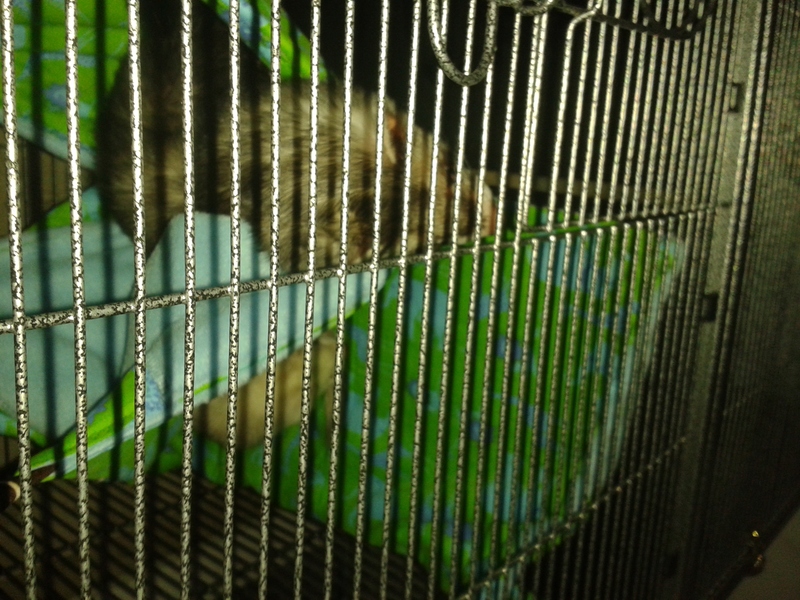 As soon as the new bedding was added to the cage we had one ferret climb in the hammock and another carpet sharking the shelf sack. I added a hammock and shelf sac in another cage and Boo Boo who is a very sluggish, large fellow with the sweetest little face was trying to stuff himself into the hammie before we hung it! The firecracker toy was also a very big success. 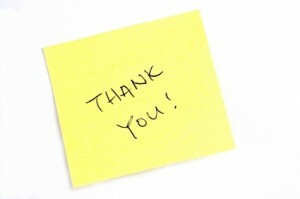 We would like to thank you very much for all of the wonderful work you do throughout the year. 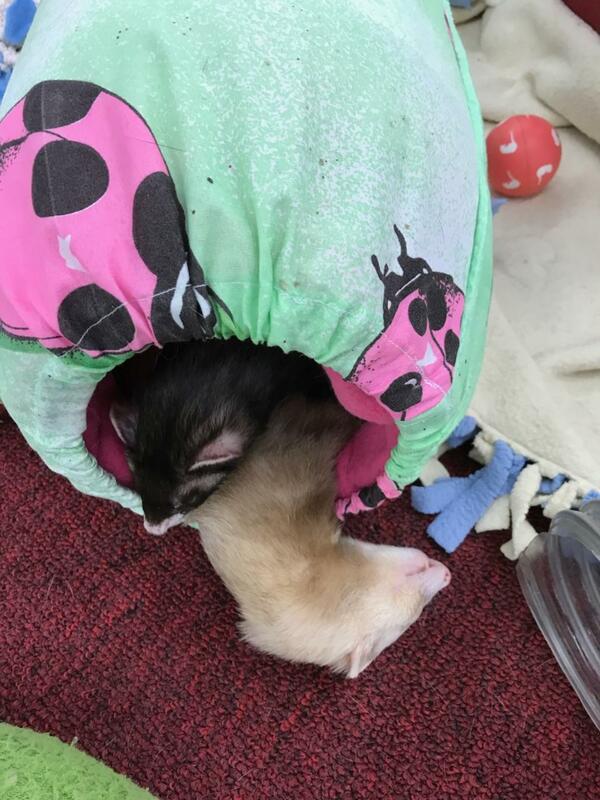 Just wanted to let you know that we receive our package of ferret bedding today. We can’t tell you how excited we were with all the different types of items. Hammocks, Sleep Sacks, Hammies for Carriers and the square Wonton Hammies. The fabrics and quality are outstanding! We know you all get together and have sewing days for shelters like ours and we are so thankful for all you do for us. 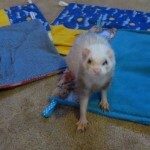 Together, we can make a difference in the lives of these ferrets that are abandoned, abused, neglected and sick. Blessings to all of you during this Season of Love and Giving! We received the box of bedding, toys and love. I can’t thank you enough for this. We had a very sad stray come in and I wrapped her in one of your hammocks. She was very sick but cuddled up and relaxed. She knew how much love was around her with the hammock. Alina left for the Rainbow Bridge the same day we met her but she knew comfort with your loving bedding. When I arrived home yesterday, there was a HUGE box of bedding for my guys & gals! I am so grateful, thank you, thank you, thank you! I’ve been buying fleece blankets from Walmart, and was down to my last unopened small sleep hammock. I’ve gotten so I wash the hammocks by hand, and hang out to dry, to save wear & tear on them. 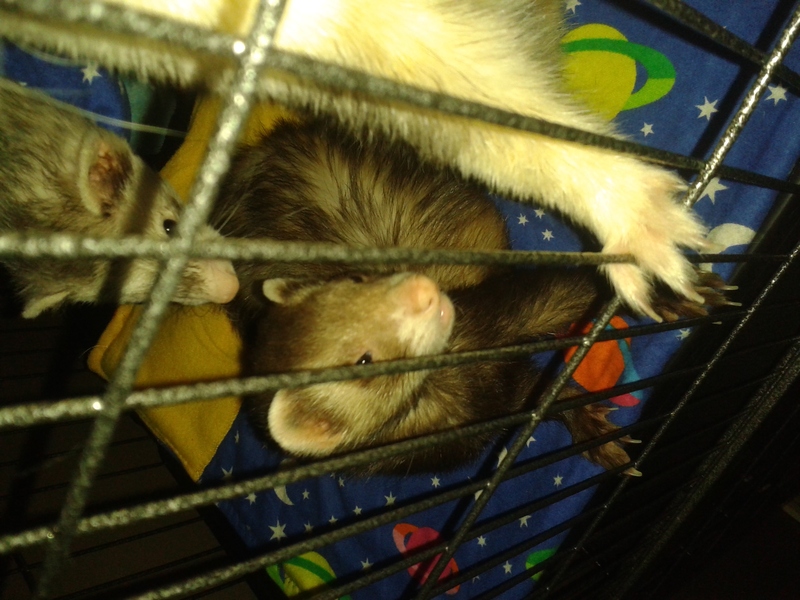 I handle all of the geriatric, terminally ill ferrets; I’m the hospice part of RFRL. I’m down to 15, which is the lowest amount of ferrets I’ve had in 17 years of sheltering. I send other incoming ferrets to a few volunteers, or to Nirvana Ridge, a new ferret shelter opened by a good friend of mine. The old ferts are my favorites, always have been. Although they tend to poop on themselves, in their hammocks, on their cagemates or wherever they just feel like it, I love their determination and will to live. Thank you so very much!! I’ll be changing out bedding all day and will post pics on my FB RFRL page, as well as my own. Hugs.! I wanted to let your group know that Ferret Haven received the box sent to us. Thank you so much for the great goodies. I can’t wait to try the sling with one of my older kid! You folks are the best! Words are not enough to thank you ladies for the wonderful new hammies we got today from you, Thank You, Thank You, Thank You. I was doing ferret cages today and their hammies were so sad and now I can put all new one in for the babies. You ladies are so wonderful for what you do and again thanks so much the fuzzies here at Luna’s thank you also. I was so Thrilled to open your box of goodies for my fuzzies!!! They have been exploring the bedding & the box. I have a couple ferrets that “love” plastic bottles so the covered bottles with rattles were grabbed right away!! 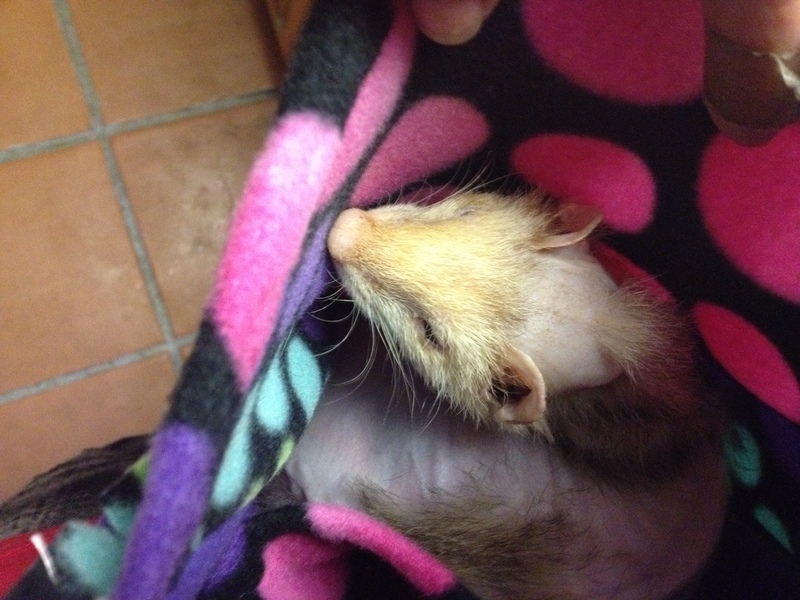 I have several sick/recuperating ferrets right now- in all 15 ferrets. Thank You so much for doing this wonderful & MUCH appreciated box of Happiness!! Bless all you ladies for the time & effort you put into this!!! Again THANK YOU so much!!!! The fuzzies said- “Dook-a-shane” ladies”!!! Thank you so very, very much for the much new bedding. We’re more of a sanctuary than a shelter. We do not adopt out any of the ferrets we get in. As the babies get older they can’t always make it to the litter box (or they just don’t bother) or the bedding gets push/pulled through the litter box/poop. The younger ones like to scratch the floor/bottom of the bedding. After a while the bedding gets holes in it or gets too dirty to wash. You can imagine how much bedding we go through. I love the comfort sling you sent us. Our oldest lady (who’s almost 9) likes to cuddle up in it and ride around with me all day. They all love the toys. It’s hysterical to watch 2 or 3 of them try to grab and stash the braided toy all at the same time. We haven’t tried the carrier hammy yet. I’m saving it until we head to the Michigan show. I do apologize for not contacting you as soon as we received the box. My daughter has been ill and in the hospital. Again, thank you all for the wonderful bedding. Dawn, a shelter mom in California, received a comfort sling for Dakota, who loves it! 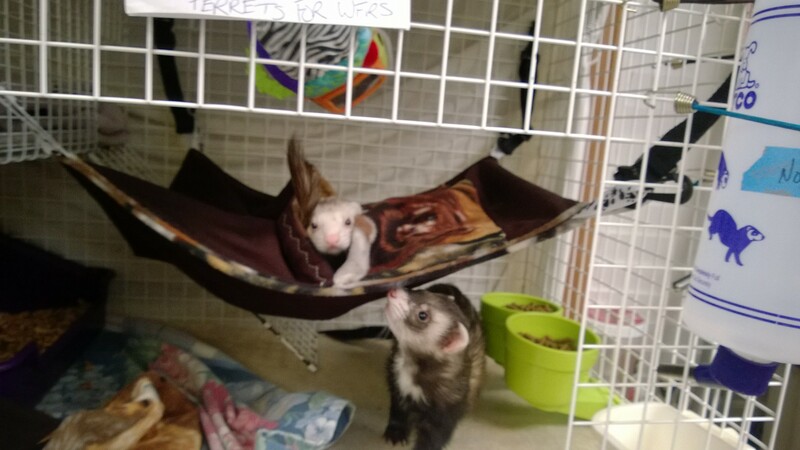 Photos from the Washington Shelter furkids enjoying their new Crafty Weasel bedding. Just wanted to let you know how much the kids love love LOVE their bedding. 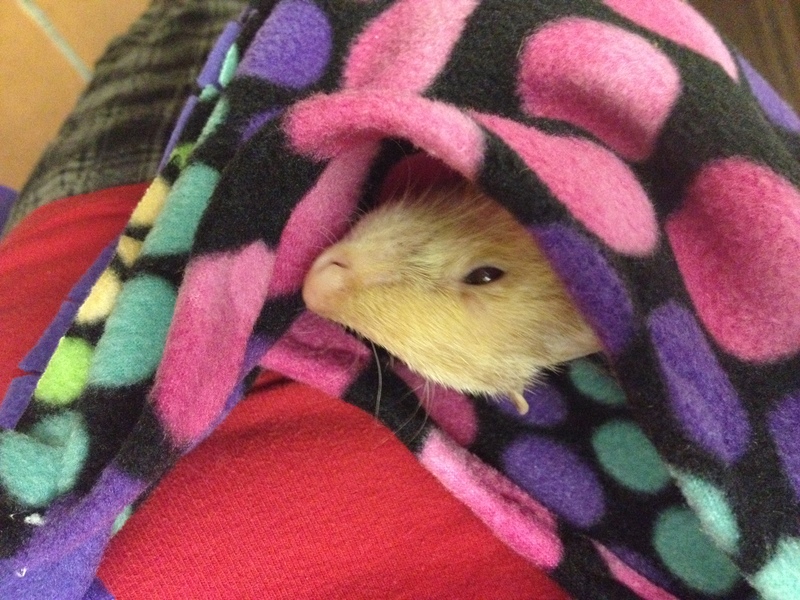 Ferris, our fragile little rescue naps in the sleep sacks all the time and has napped in the sling as well…THANKS! Thank you so much for all the bedding and toys! They are beyond awesome! 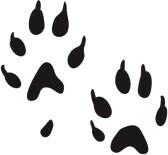 We will be taking pictures and posting them to our rescue page. Bless all of you and again thanks. Thank you so very much for your generous donation of the box of beautiful bedding for our homeless fuzzies in the GCFA shelter!! Your amazing sewing talents, love and thoughtfulness are extremely appreciated by all of us at the GCFA ! As Tracy told you I will make sure to keep this precious bedding in a safe, off site location until we are in the cleared of this nightmare. Please pass along our thanks to all who worked so hard on making sure our ferrets, who have been through so much, will get this wonderful bedding! THANK YOU sooo much!!! to Florence Love and the Crafty Weasels for sending us some cage bedding!!! As always, they are sooo very pretty and you can tell are made with pure love!! HUGE Thank yous to the Crafty Weasels for donating so many awesome sleepy sacks & hammies & toys for our ferrets!!!! Yay! Thank you to Amereta & Jeff for bringing all that great stuff here! The package arrived yesterday . My fuzzies are having a ball. Just a quick note to let you know that the box of bedding arrived yesterday. Thank you all so much for everything. I’ve posted some pics on our Ferret Dreams Rescue & Adoption Facebook page for all to see. Thank you all for helping us and all the other rescues around the country. Oh my goodness!! I am totally speechless at the wonderful box that arrived tonight!! I am so very excited to hang it up for all the kiddos, and see what they think! It is a beautiful thing you all do, and the kids have already had a blast with the noisey toys! We, and they, are very grateful for the package, and thank you from the bottom of our hearts! As the little ones we have taken in are adopted out, we will be sending pieces of your beautiful bedding with them, so they will have something wonderful to nap in, and will pass the contact info of your group on to the new family. I will be putting pics of the bedding up and your contact info on our page, Ferretpallozza, tomorrow evening when I get home, got home late tonight. We are truly grateful for the wonderful box of goodies we received tonight, and please let us know if we can re pay you in anyway!! Maggie and Jamie, along with Claire, Fredi, Amber, Sampson, Daisey, Apollo, Bear, Oscar, Bonnie, Clyde, Hercules, Pete, Jasper, Gibson, Sable, Daphne, Bolt, Sawyer, Zeus, Posiden, Pixie, Wolfy, Bandit, Moose, and Gilbert!! Florence and all the members of Crafty Weasels of Georgia, I can’t thank you all enough for your continued support of my rescue. Folks like you make it possible for me to spend the very limited cash I receive on medication and surgeries. Your beautiful bedding and toys enrich the lives of these forgotten and sometimes abused babies we all love so much. From the bottom of my heart, THANK YOU ALL! I received your wonderful package of goodies today. It will be so nice to replace all of my worn out bedding with some pretty new items! My old bedding will be recycled to our wildlife rescues. The work that you do is so wonderful and a true blessing to the ferret community. Thank you for everything that you do! Wow! Thank you so much for all the bedding. Our rescues love the bed hammock combo, but we didn’t have enough to provide them for everyone. Now everyone has one. Everything sent is being used. I am so happy to see that big’ol Brutus fits comfortably as do our bonded pairs. The sling is an awesome design. 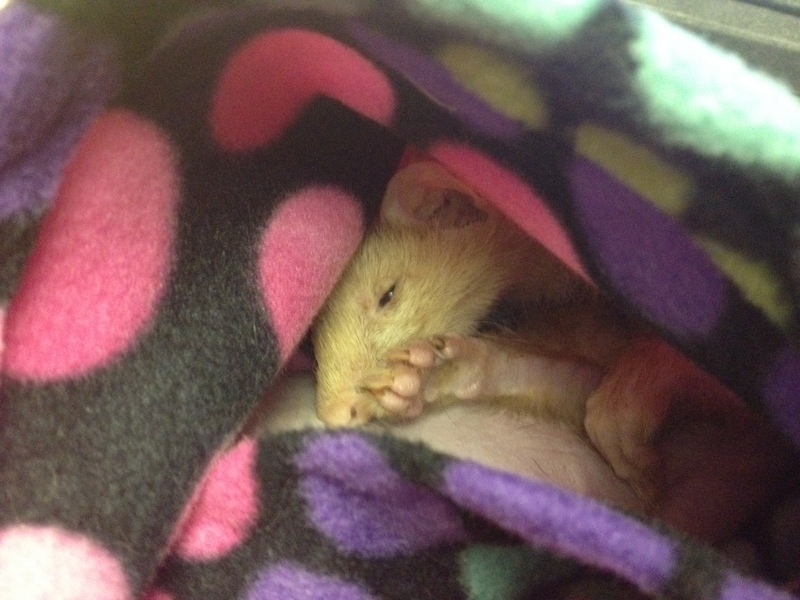 All the humans and ferrets at Navarre Ferret Rescue send you a heartfelt thank you.